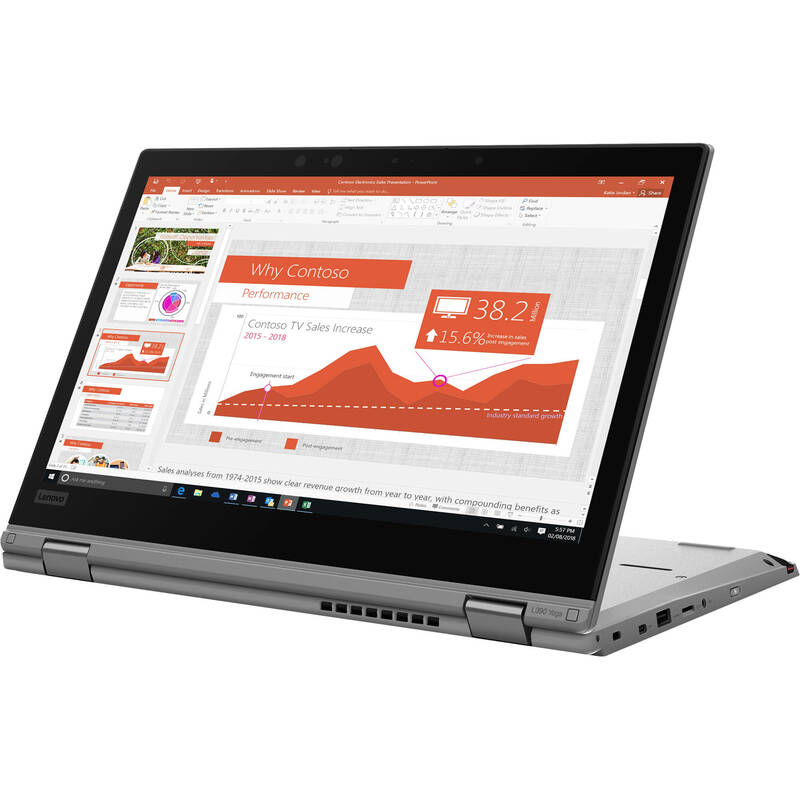 The silver 13.3" ThinkPad L390 Yoga Multi-Touch 2-in-1 Laptop from Lenovo is designed for business purposes, featuring the performance, security, and portability users need. Specs-wise, it's powered by a 1.6 GHz Intel Core i5-8265U quad-core processor, 8GB of DDR4 RAM, and a 256GB M.2 PCIe NVMe Opal2 SSD. Should you need more room, you can attach external storage solutions using its USB 3.1 Gen 1 ports, as well as quickly offload data to other devices with its microSD card reader. Its 13.3" display, driven by an integrated Intel UHD Graphics 620 chipset, features a 1920 x 1080 resolution for crisp and clear Full HD playback. Moreover, it supports 10-point multi-touch capabilities and has an HDMI port that you can use for connecting a display for larger viewing and enhanced multitasking. Other integrated features include a fingerprint reader, Wi-Fi 5 (802.11ac), Gigabit Ethernet LAN, Bluetooth 5.0, a webcam, a microphone, speakers, and an audio in/out jack. A ThinkPad Pen Pro stylus and 65W USB Type-C power adapter are included with this 2-in-1. The operating system installed is Windows 10 Pro. The ThinkPad L390 Yoga is designed to be secure, reliable, and mobile. Its discrete TPM 2.0 chip and a Match-on-Host fingerprint reader help to safeguard your data. Baked into its DNA is durability. What's more, it weighs from just 3.4 lb. Thanks to its high-performance Intel processor, high-speed DDR4 memory, and a 12-hour battery life, the ThinkPad L390 Yoga is no slouch. It also has Rapid Charge to boost the battery back up to 80% in just one hour. For advanced security and manageability, you can opt for a model with Intel vPro technology. With a full range of ports, including two USB Type-C outputs and a single HDMI output, plus smooth wireless technology, the ThinkPad L390 Yoga lets you hook up all your favorite devices. The ThinkPad L390 Yoga has a 13.3" touchscreen display, with IPS FHD technology for wide-angle viewing and enhanced color quality. Configure the ThinkPad L390 with an optional backlit keyboard, which is perfect for low-light environments. Box Dimensions (LxWxH) 18.5 x 12.0 x 3.3"